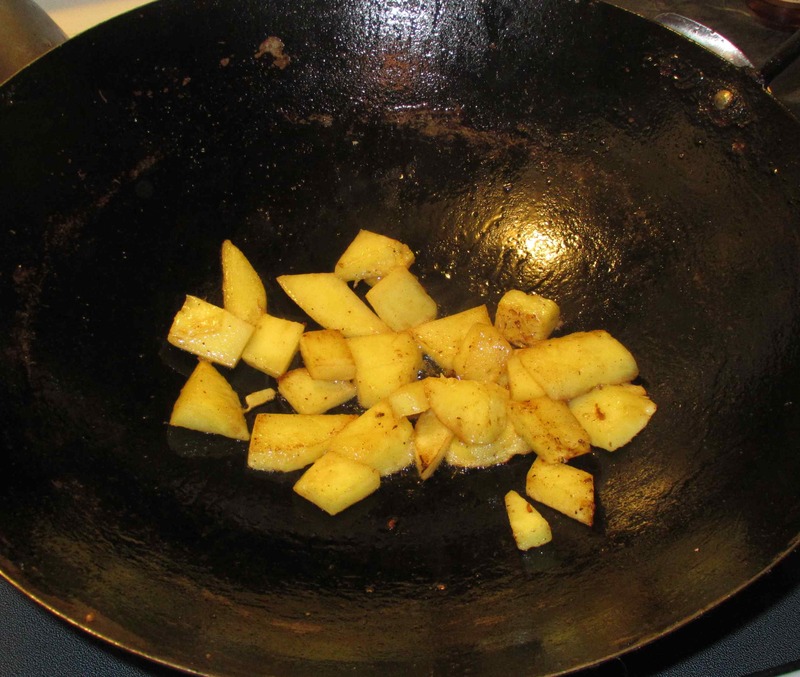 Heat your wok over high flame and add a couple of tablespoons of cooking oil. When the oil is shimmering, add the cloves, cardamom pods, cinnamon stick and fry briefly until the cardamom shell is just starting to get a little darker and the oil is infused with the flavor of the spices. Season the prawns with the salt and pepper then stir-fry quickly until they have turned pink and then remove to a bowl. Now fry the pineapple slices as well. The idea is not to stir-fry here, so much as to pan-fry each piece on each side so that they get nicely browned. 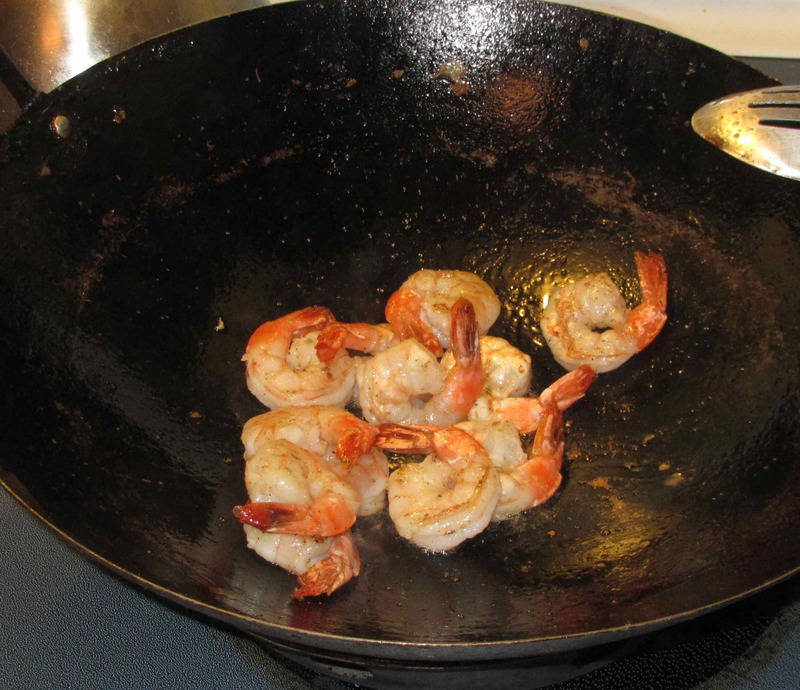 Work in batches, if necessary, and when the pieces get done, transfer to the same bowl as the shrimp. At this point, you can discard the spices. 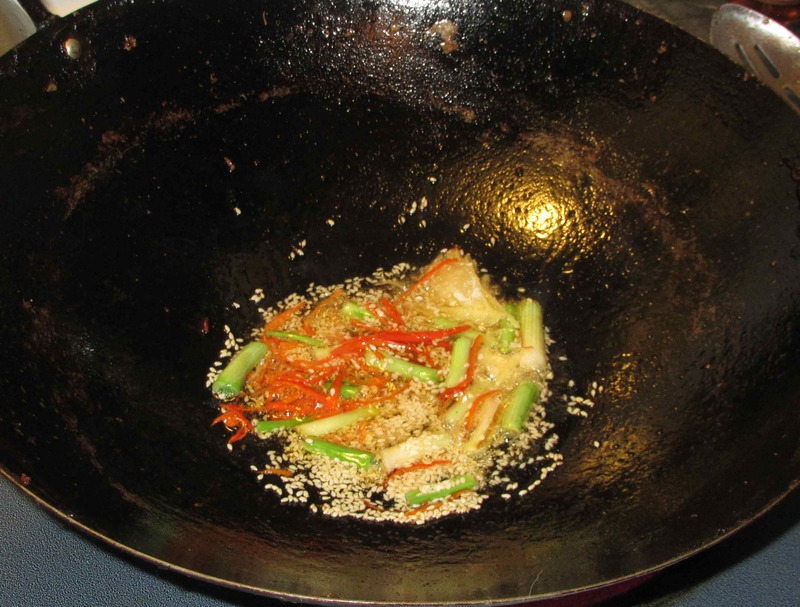 Add enough plain oil to the wok make 2 tablespoons (if necessary) and then add the sesame oil as well. When the oils are hot to the point just below smoking, add the ginger, sugar, chili shreds, the sesame seeds and the white part of the scallions and stir briefly until the mixture thickens. 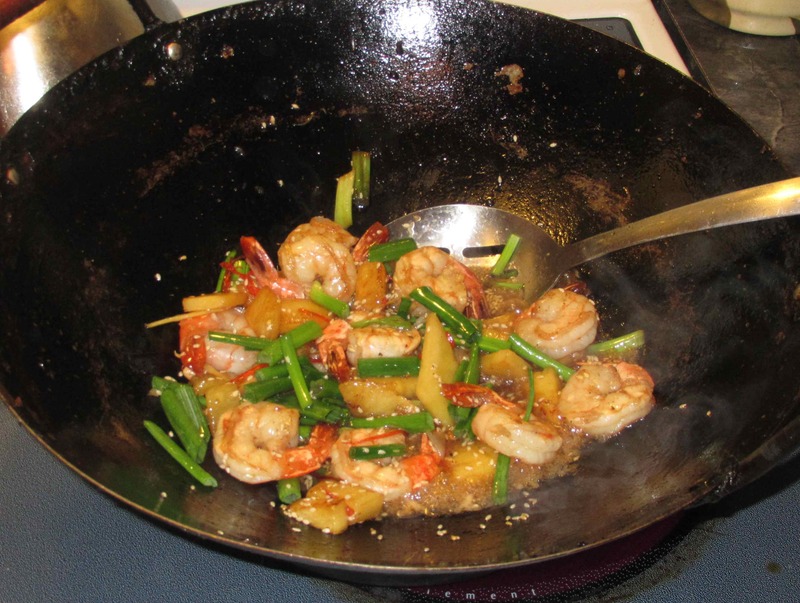 Add the shrimp, pineapple, scallion greens, rice wine and soy sauce and stir-fry vigorously until the scallion greens are wilted, everything is heated through and the sauce forms a nice glaze. Plate and serve immediately. How delicious! Love those jumbo sized prawns and all of your spices. I bet I could eat this whole serving myself! Will definitely be trying out this recipe – great idea! Thanks! 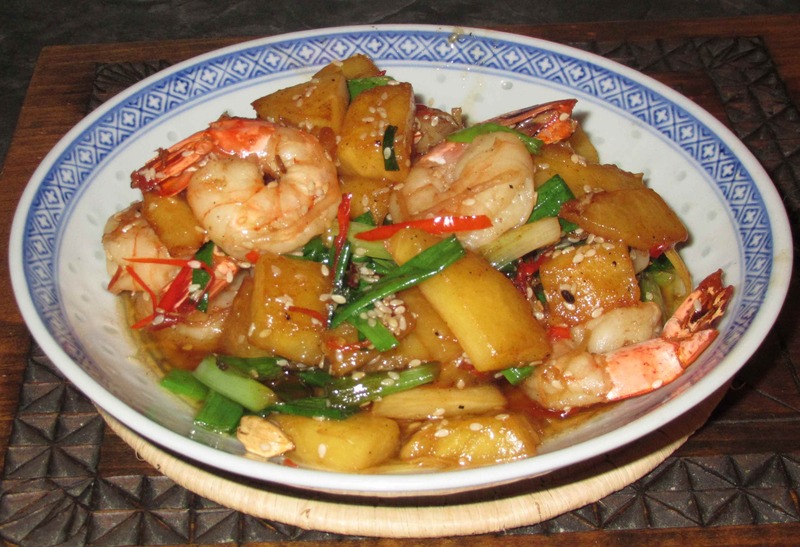 You shrimp with pineapple sounds delicious. Those little Thai chilies can be extra hot sometimes but they do add to the overall taste of the dish. I love this! Thanks for the detailed instructions. A lovely simple recipe!! Yum!! This looks delicious!!! Must try it this weekend. Thanks for posting. This looks fantastic. 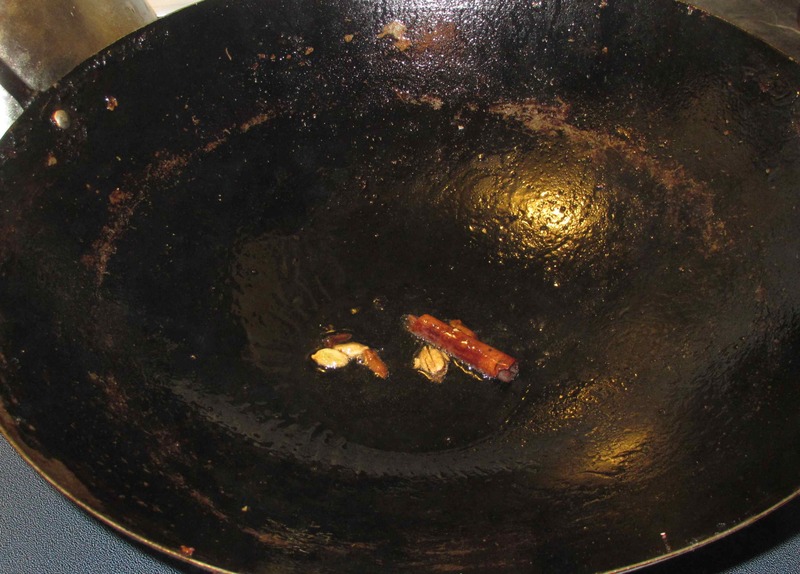 And you have a beautiful patina on that wok! I can’t remember exactly when I got the wok, but I have been cooking with it for pretty near 30 years as far as I can guess … definitely 25! I love that. Can’t wait to see what my cast-iron pan will look like in 25 years.